Laser measuring tapes are a convenient piece of technology that can quickly give accurate measurements. They are compact enough to fit in a pocket and are easy to use. 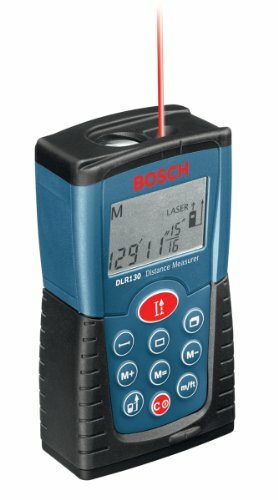 Know how you are planning to use the laser measuring tape before you purchase. There are lots of different types of laser levels available for a variety of different jobs. Before you buy one, it’s important that you do your homework and learn how to use a laser level. Laser measuring tapes are no exception to this, as with any products that use lasers, there is an element of risk to the unskilled user. Range is going to be one of the most important features to look for with this kind of tool. It should give you the advantage of measuring long distances that can’t be done with a standard measuring tape. Being able to take quick measurements is another key feature that will make using this device invaluable. Automatic calculation of area and volume. Auto correction and error report technology. 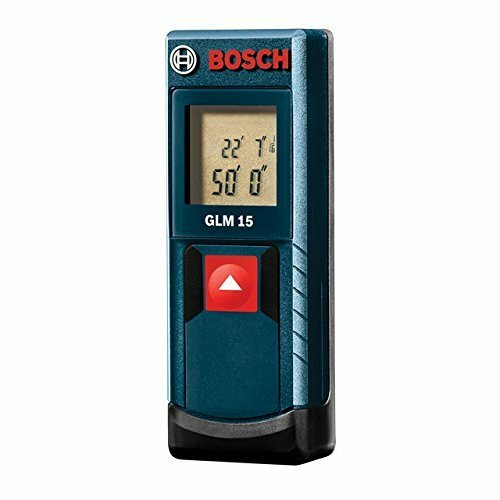 The GLM 35 can easily go with you on the job or stay in your pocket while you climb a ladder before taking a measurement. It is compact and sturdy and can measure up to 120 feet giving an impressive range that most standard measuring tapes can’t even begin to cover. 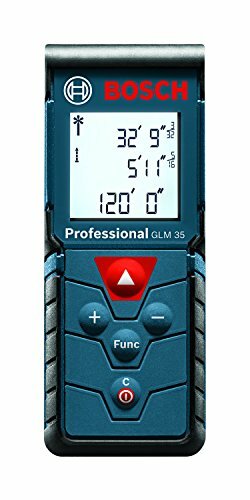 The GLM 35 can measure area, distance, length, and volume. It also allows takes continuous measurements and can do addition and subtraction for you. Calculating the area of a space can be done with the GLM 35 as well. The backlit display can be viewed in dim lighting and it has an accuracy of up to 1/16th of an inch. The DW 3050 can automatically calculate volume saving time. It can measure distances up to 165ft to within a 5/16th of an inch but at shorter distances it can come within 1/16in. When measuring distances from 131ft to 165ft, you will need a target plate to get accurate numbers. Indirect height measurements can be taken using Pythagoras. Up to five measurements can be stored in memory so you don’t need to write them down when while measuring. This allows you to write the measurements when it’s convenient for you. With a two-line backlit display, you can clearly see numbers. 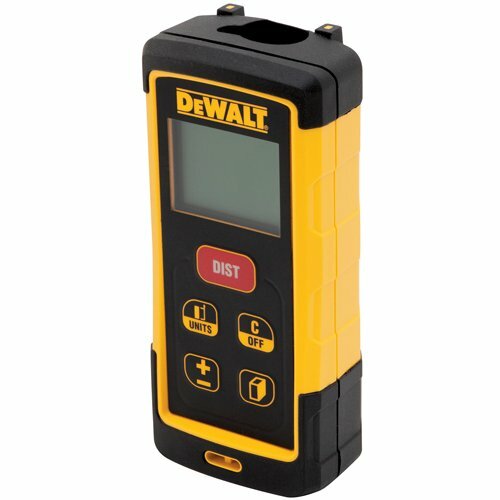 The DW 3050 is incredibly durable making it suitable for use by contractors. Accurate measurements can be taken after dropping and heavy use. Similar to the GLM 35, the GLM 15 is a compact version that still packs a powerful punch when taking measurements. It uses an impressive one button operation wherein with one push it measures in continuous mode. Push the button again and the GLM 15 will hold the measurement. Measurements are accurate to within 1/8in. The highlight of the GLM 15 is the compact size and shape. It is small enough to fit in a pocket. It only measures up to 50ft but that is enough for use around the home. 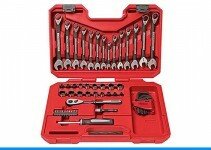 This model does not have the backlit display but it is an easy tool to carry in the car or slip into a toolbox because of its small size. The DLR130K measures up to 130ft and is accurate to within 1/16th in. With the four modes of length, area, volume, and continuous, you’ll be able to get a versatile range of measurements. Measurements can be taken in inches, feet and inches, decimal feet, and metric units. You can convert the different measuring units when needed. This lightweight measuring tape has a soft ergonomic grip making it easy to hold. If carried in your pocket, you will barely feel the weight of it. Getting quick measurements can be the key to getting a job done on time. As the laser completes a measurement it beeps and vibrates so if you are wearing hearing protection while on the job, you will know when the measurements are done. The GLM 50 has an upgraded backlit color display for better visibility. The colors of the display change according to the setting being used, making it easier to keep track of what mode it is in. It has the basic functions like real-time length, length, area, volume, and indirect measurements. When taking real-time measurements, the display will show how distances move in relation to the target. There are threads on the bottle where the GLM 50 can be used with a tripod. The GLM 50 has some extra features that make it stand out from other laser measuring tapes. A built-in inclinometer allows for taking angles, min/max distance tracking, stake out, and double indirect measurements. It also has Bluetooth functionality that can be used with Bosch apps. Measurements can be taken and uploaded to the app and overlaid on house plans or site plans. Once the information has been entered into the app it can be saved for later reference or sent out via email. 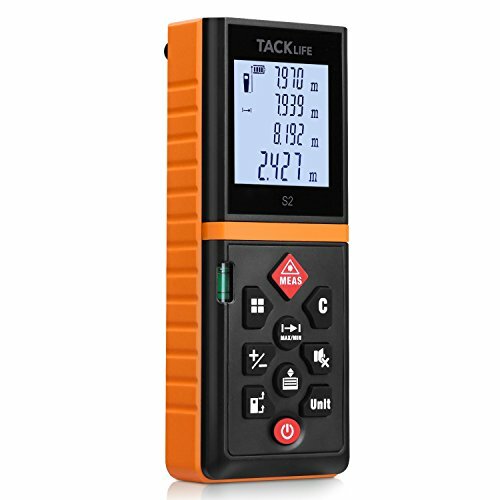 The Tacklife has a large, multi-line backlit LCD display that helps viewing while in dim lighting. The multiple lines make it easier to keep track of various measurements and features being used at one time. It can be used to take basic measurement, like area and volume, but also includes some advanced features such as indirect measurements that are calculated by using the Pythagorean Theorem, continuous measurement, min/max distance tracking, and adding/subtracting of measurements. The Tacklife can take measurements from 2in. up to 262ft giving an excellent range that is well beyond a standard tape measure. With a small size and ergonomic design, it is easy to handle and portable. It can display measurements in inches, feet, or meters. A memory feature stores measurements so you can take several before writing them all down saving you time while you work. The DMiotech can take measurements up to 80 meters and displays in meters, inches, or feet, easily switching between the three. It can take quick measurements of distance, area, and volume as well as being able to add/subtract measurements. Indirect measurements are also taken using the Pythagorean Theorem. When taking measurements, you can switch between front and back benchmarks, which allows you to have versatility and accuracy when using it in tight spaces. The large backlit LCD display is easy to read. It includes auto correction and error reporting technology so that you can stay on top of the latest fixes. It comes equipped with a bubble level which allows you to keep your measurements accurate. While it measures accurately to within 1/4in, if you need more precise measurements, you may want to use a standard measuring tape. 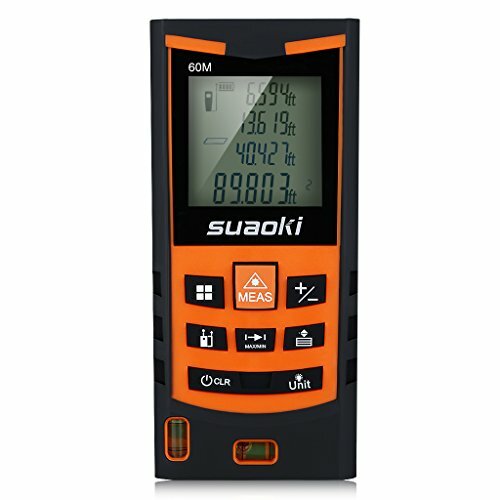 The Suaoki measures to within the 1/16th in with three measuring units – meters, inches, and feet. While it defaults to metric units when turned on, it can be changed quickly for those that prefer inches and feet. With a 4-line backlit display, you’ll be able to see in the dim conditions often found on work sites. Beyond the basic measurements of length, area, continuous distance, and volume it can also take indirect measurements and offers an add/subtract function. It also can be used with three optional reference points to help in triangulating measurements. The memory can store up to 20 measurements, leaving you free to take several measurements before writing them down. This can save valuable time when measuring a room or house. A water resistant rubber case not only keeps the Suaoki dry in the rain but also helps absorb the shock of being dropped. The GLM 80 uses a lithium-ion battery that allows you to take up to 25,000 measurements. With a 265ft range and 1/16in accuracy, the GLM 80 is an excellent choice for a laser tape measure. Indirect measurements are easily taken with a two-axis, 90 degree title sensor that turns on with a single click of the button. A backlit tilt screen display gives you the option of viewing in multiple directions when the GLM 80 is tilted beyond 75 degrees. It can store up to 20 measurements, both distance and angle. You also have the option of saving a measurement long term by setting it as a constant. This can save you valuable time while working on a long project. The case is designed to withstand drops of up to three feet and resist dust and water making it a durable piece of equipment for any construction site. 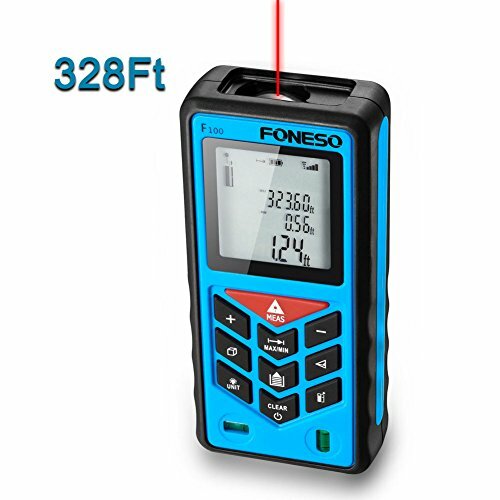 The Foneso Laser Distance Measurer has a measuring range of up to 100 meters (328 feet) and can display in meters, inches, or feet in both decimals and fractions, accurate to 1/8th of an inch. 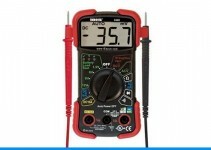 The four line LCD display gives you plenty of area to read measurements and is easily visible. 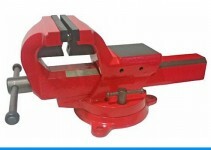 Measurement modes include single distance, continuous and area.